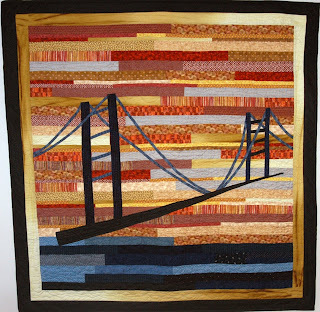 This quilt was made for a quilt show in Northern California- the Pacific International Quilt show. It hung there last fall, and I just recently was able to give it to my Mom who loves San Francisco. I wonder if she will hang it ...and Where? I'm making a small quilt for an upcoming wedding shower. This pattern comes from the designer Sandy Klop in the Oct. 2008 issue of McCall's Magazine. My colors are much different than the 30's fabrics she used. 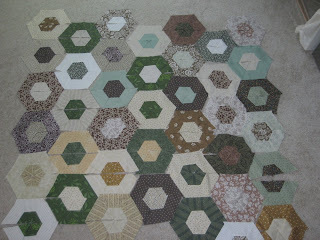 I'm wondering now if I really like the colors....Hope it looks better when it's all together and quilted. I made these 2 quilts for co-workers who will be assigned to another position soon. They work with severly handicapped adults in a day program. The class I have been in as a substitute teacher is being closed and these 2 ladies are sad to say goodbye to students and are also wondering what the future holds for them. This is one of those sad times that inspire me to ---- give them a quilt. I asked, "What color would you like?" One said, "colorful and bright". The other one said, "Pink". So, here are the quilts. Small and simple, but I hope can give them a little love and comfort as things in their lives change. on yesterday. 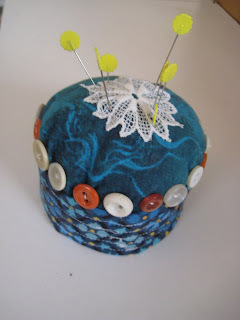 I found a tutorial for this on Crazymomquilts.blogspot.com. It was easy and fun to make using some fabric my husband brought back from Israel. I added buttons and a small piece of lace for the top. 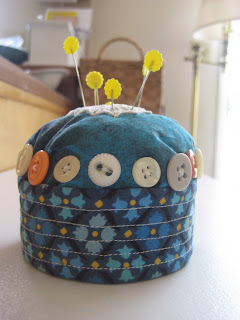 You can't have too many pincushions!